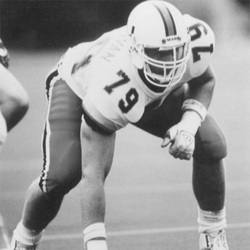 Mike was one of the Canes toughest and most durable offensive lineman in its storied history ! The Chicago, Illinois native came to Miami out of St. Francis DeSales High School where he was named first team All-Area. As a redshirt freshman in 1986 while working on the scout team, he honed his skills against possibly the best defensive line in college football history, with the likes of All-Americans Jerome Brown, Greg Mark, Dan Stubbs and Bill Hawkins. Beginning in 1987, Mike would start every game for four years, ending his career by setting the school record for consecutive starts at 48 games. Miami would go 44-4 during that span and win 2 National Championships (1987, 1989), and the first 36 games of the NCAA record 58-game home winning streak at the Orange Bowl ! The son of Irish Immigrants, Mike was certainly a good luck charm for the Canes, as they finished ranked no lower than #3 in the country ! Playing 2 years at offensive guard and 2 years at offensive tackle in front of quarterbacks Steve Walsh, Craig Erickson, and Gino Torretta, he and his linemates formed the protection to allow them to set school records for Total First downs (35), Total Passing Touchdowns (6), Most Points in a Quarter (35) and 2 of the top 3 record Passing Yardage games in school history (Torretta 468, Erickson 467) ! He also cleared the way for the career rushing touchdown leader, Stephen McGuire. His Senior season, the team set a record for most yards per game (482.9). Mike was twice named an Honorable Mention All-American and was named an AP All-South Independent First Team selection. Administration in 1995. He was selected as a member of Omicron Delta Kappa National Leadership society and was tapped into the Iron Arrow Society for his outstanding leadership, character, and service to the University ! He is one of only 2 Canes to receive an NCAA Post Graduate Scholarship. He is also the school's only two-time winner of the CBS/Toyota Leadership Award. Mike was drafted in the 6th round of the 1991 NFL draft by the Dallas Cowboys and played one year for former coach Jimmy Johnson before going to Tampa Bay and playing for the Buccaneers for 5 seasons. After retiring from the NFL, he got into coaching and spent four years in the European Federation of American Football, before returning to Miami as a graduate assistant in 2001. He also has coached at Western Michigan University and for the Cleveland Browns. Currently, he and his wife, Carole, reside in San Diego, with son Patrick and daughter Teagan, where Mike is an offensive line coach for the Chargers.